What can be done? 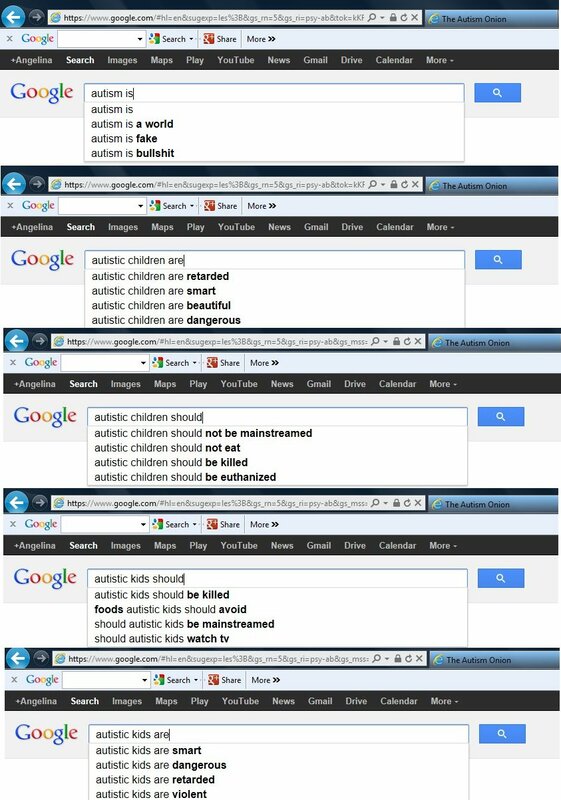 Well my community of autistic adult activists, a group not made up of neurotypical so-called experts like the writer of this piece, has fought the ableist devaluations contained in these search results through blogging alternative answers to “Autistic people should” and “Autistic people are”. I’m not sure if the writer of this blog knows anything about disability discrimination, but if they were autistic, they would know plenty because this kind of rhetoric is part of the daily lives of people on the spectrum. One of the best ways of helping autistic people like me is not to try to cure us, but to challenge the discriminatory systems of thought which harm us. Hi Zach. I’m a little confused by your comment. No where on my blog does it say I’m an expert. 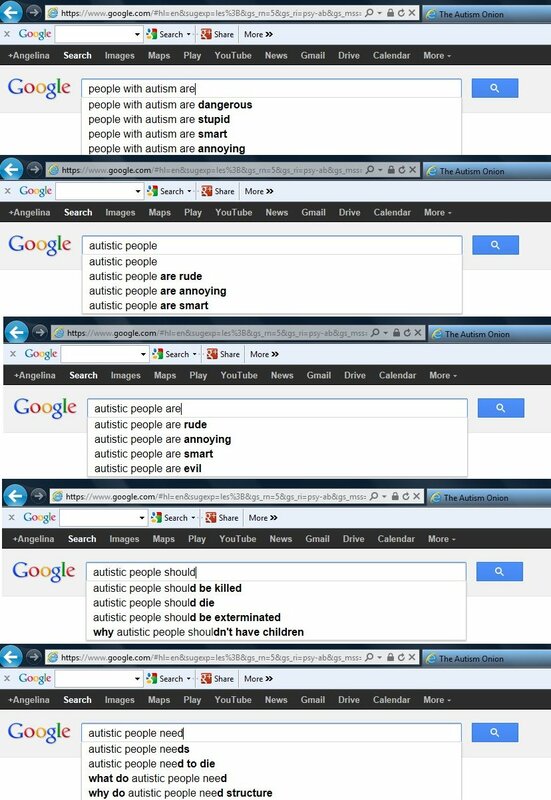 Also, I don’t understand the hostility towards me just because I am different than you (aka: I am not autistic). Isn’t that kind of treatment and attitude exactly what you yourself are fighting against? Also, my posts serve to do exactly what you stated would be helpful, “to challenge the discriminatory systems of thought which harm us.” I believe if you let your guard down for a second you would see that you and I are on the same team on this issue; both fighting to stop the hateful ignorance towards people with autism. autisticpeopleshould.blogspot.com, autisticpeopleare.blogspot.com are both in response to the issue you’re talking about. Partially because Google, mostly because the attitudes that are represented by Google having gotten those autocompletes. Thanks, Alyssa! I checked out those pages last night and left a comment letting the webmaster know about my attempts to rectify this as well.